It discusses new methods to measure SDG indicators related to universal health care, securing land rights, measuring road accessibility in rural areas. These are so-called “Tier 3” SDG indicators because of new or untested methodologies and insufficient data coverage. Chapter 11 discusses how the terms “urban” and “rural” have no consistent international definitions in spite of being routinely used to describe environments and the lives of those within them. Chapter 6 presents data on access to water, and how measurement in this area is evolving. The “unimproved–improved” water source distinction is being replaced by “safely managed” services in a new monitoring framework. 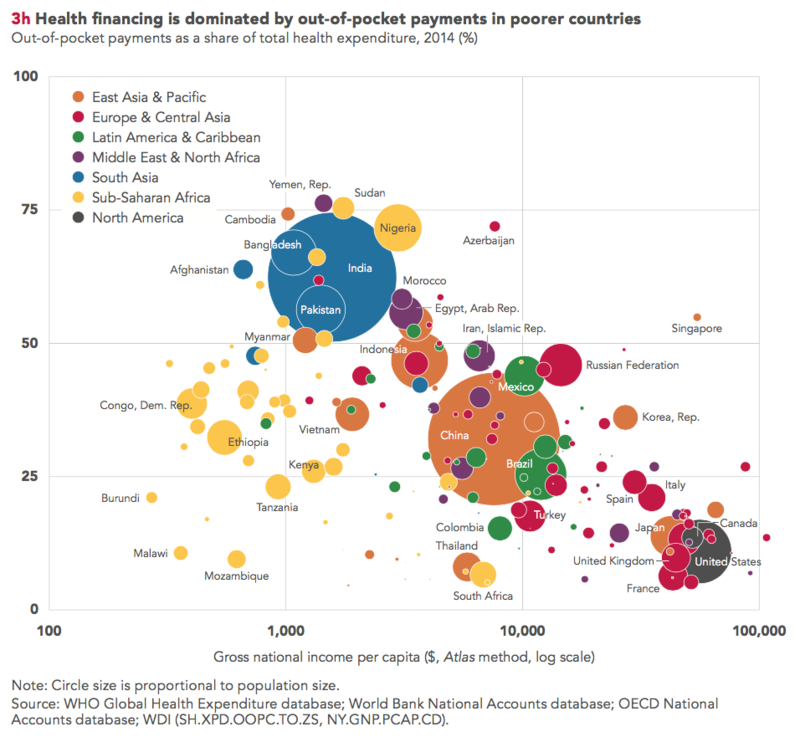 In Chapter 3, data from the WHO, OECD and World Bank are combined to show that health care financing in many low- and middle-income countries is still dominated by high out-of-pocket expenditures. 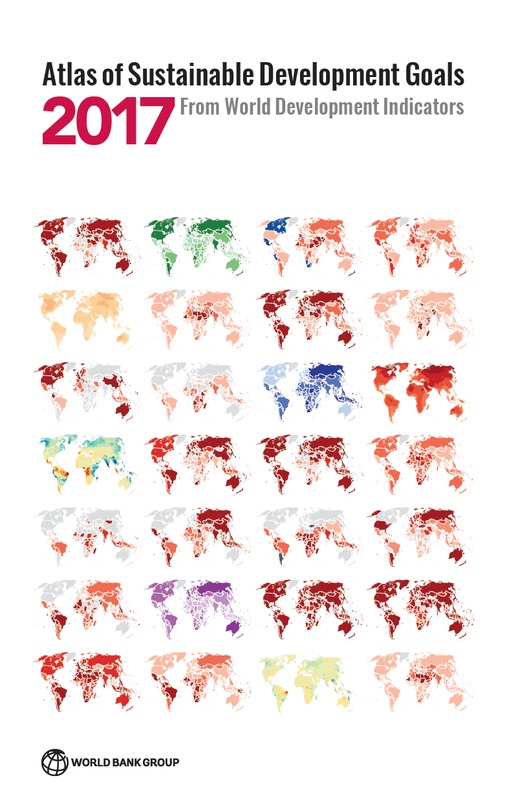 The Atlas of Sustainable Development Goals draws on World Development Indicators, a database of over 1,400 indicators for more than 220 economies, many going back more than 50 years. It relies on the work of national and international statistical agencies around the world. The professionals working in these agencies play a crucial role in measuring and quantifying the development process, so that we can all make better decisions about our lives and the scarce resources we all manage. From the World Bank, the Atlas presents the perspective of subject matter experts in our Global Practices and Cross-Cutting Solution Areas and of data experts in the World Bank Data team. We’ve worked together to share the best of our institution’s knowledge and data in a manner we hope is engaging, understandable, and that ultimately informs the development community’s thinking. Bulk download files of the WDI dataset in CSV and XLS formats, direct access via our API and via third party API wrappers for popular languages including Python, STATA and R.
You can follow future blogs based on the WDI and the SDG Atlas here on the The Data Blog, and keep up to date with our latest news via @worldbankdata on Twitter. Very nice. How can I copy animated graph, with acknowledging WB. Actually no, the number of children in the world has reached its peak some time ago. Population is not rising uncontrollably. Already the Earth has a TFR of close to 2 children per woman on average, which will mean that the population will stabilize at about 11 million people. Thank you for a Great job well done. I would argue that Syria, Iraq and Egypt should be among countries with extreme poverty. Does show otherwise or there is no enough data? I would very much like to follow the discussions on the new monitoring framework for water and sanitation. Most sub-Saharan African countries do not have medium and and long term development plans. Scanning through the informationa as it relates to Nigeria, it is observed that the number of people living in extreme poverty increases as the population increases annually. It is therefore necessary for the World Bank to assist states within Nigeria to device strategies to curb the exponential population growth, knowing fully well that the smallest state in Nigeria today is more populated than most countries in sub-Saharan Africa. Development of basic infrastructure is more desired for ending poverty at global level. To end poverty, there is need to development of country resources in terms of providing better irrigation facility, electricity, education and development of employment avenues. It can be achieved through good governance. Good governance can be bring through the people of the country by selecting right person or electing right person for the country. Poor country is always became only subject matter of research. To end the poverty, there is need to provide resources at ground root. Agreed, except most of the poor have zero control over "good governance". I noticed from the map that the number of poor in most countries has come down substantially with the notable exception of those in Africa. Likely because most African countries are run by tyrants and when we provide monetary aid, it is simply snatched-up by these thugs instead of getting to those who really need it. Africa has a wealth of natural resources; instead of working to help them grow fossil-fuel production (the cheapest form of power generation), we are forcing them (because of some unproven computer modelling regarding "climate change") to work toward very expensive solar and wind generation. It is fossil fuel that spurred the amazing growth in the US and Europe to get us where we are. Why are we not assisting them to use the same technology (which today can be made relatively clean) to help them grow their economies. And growing their economies is, in the end, the only thing that will help their poor. Keep me up to date and posted. Very useful tool, congratulations! It’s really excellent work base on decision oriented information .I also like to produce such kin of atlas for Pakistan. Very interesting, truly global and concentrated , no trills no frills! Thanks for the useful data! Nice one! World Bank's open data access policy is good for African researchers. It is important to create in Guatemala, Management and Planning for solids waste and waste water, municipalities doesnt have none professional studies because corruption inside municipal corporations and for them environment is not a priority. Interesting data. Keep up the good work. I would like to congratulate to the team of the World Bank for preparing such a fruitful work. I am very interested to follow discussions on the impact of climate change on wildlife. 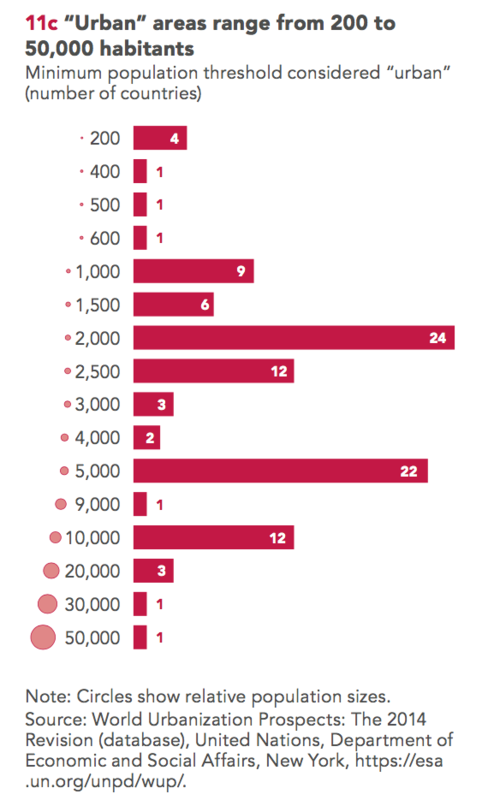 I like the presentation of data and information which are so clear and pertinent. The University which I work in has progressive plans to further the cause of SDGs and would be developing new curricula to teach starting next year. We would most welcome such information and perhaps also some guidance. Is this available for download as PDF? 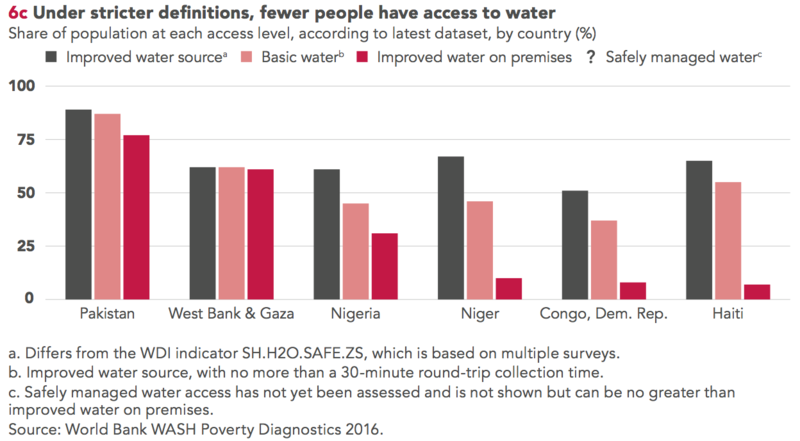 according to this satisties shown ,there not improvement for africa when it comes to water and sanitation. Great job, many thanks for the people who gether those datas, very helpful, indeed. Need this for my thesis. Need this for my thesis. Thanks alot..Came in handy.